A couple of years ago we made a pilgrimage to le Mont Dore in the Auverge. This tiny resort, dating from France’s belle époque is best known as a family ski area. 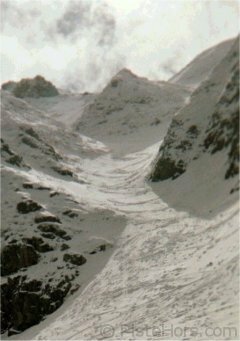 But we had heard from the locals that it also had some of the best lift-served couloir skiing in France. We were not to be disappointed describing the spot as a “couloir Mecca”. A number of people have followed in our footsteps most notably the journalists at the respected Montagnes Magazine. They were clearly surprised by our article but seem to agree with our assessment of the spot. Montagnes are not the only people who’ve been reading PisteHors.com. In October the Guardian Newspaper described us as “the best website for expert skiers”. There are clearly a lot of you. We are currently serving around 100,000 pages views per month. That is around 15 gigabytes of data including images. I think the Independent mentioned us in relation to avalanche statistics a few weeks back.